The growing urban sprawl from the top of the CN Tower, Downtown Toronto. Toronto is located in Canada’s southeast Province of Ontario. Toronto is the most culturally diverse and poly-ethnic city in the world claiming home to 2.5 million people where one in two residents are not Canadian born. As a result, the unique quality of the 1,749 square kilometer urban zone is forever expanding and offers enormous detail to a range of diversely artistic and modern megacity with a rich history from Canada’s days of British rule and Independence. Although Toronto is not regarded as an economic powerhouse it is home to true cosmopolitanism and is an educational landmark through its artistic commitments and culturally unique society. Toronto is a city of rapid urbanisation and was founded by the French in 1615 before becoming a major international trade route in 1750 when Fort Rouille was built in order to control trade navigation around the Great Lakes. This establishment dubbed the area “Muddy York” to which it is still nicknamed today. In 1763 “Lower and Upper Canada” was obtained by the British through the Treaty of Paris and despite defeating the Americans through many invasions, Britain increased Canadian government control from 1828 whereby the first of Canada’s European immigrants descended on the area. In the years to come, immigration increased as the discovery of gold, silver and uranium generated labour in Toronto thus calling for architectural developments to take place. This expansion however created division between the working and capitalist classes and severely diminished the overall standard of living. During this time, Italian and Jewish groups settled and continued throughout the Great Depression, opening department stores such as the famous Eaton Centre in the centre of town. During the Second World War, migrant restrictions were placed on Ontario but the post-war era led the way for an influx of European migrants in the 1950’s and later in the 1970’s South East Asian and South American migrants docked on Toronto’s shores. Toronto took hold of this phenomenon and through cultural policy generated culture production as an economic basis whereby a new growth of social agendas took place. 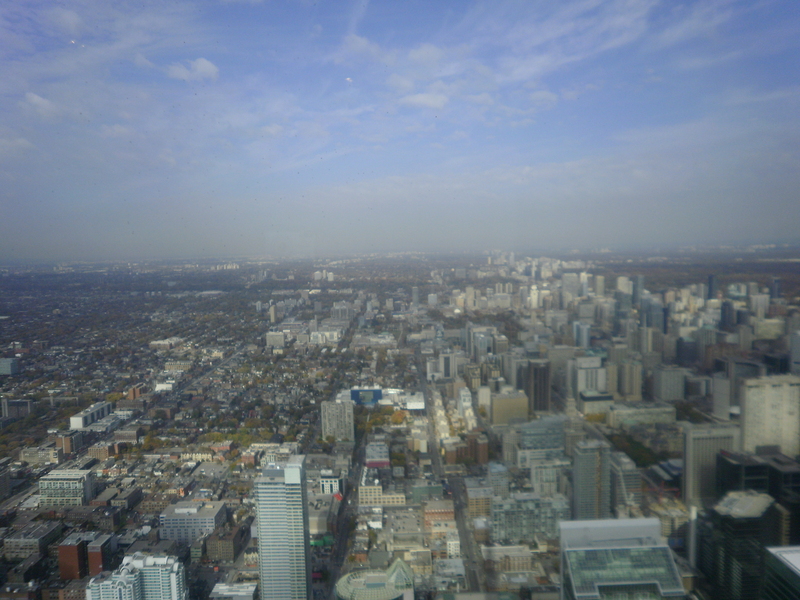 In the 1990s the suburbs of York, East York, Scarbourough, Etobicoke and North York joined to create what today is known as the Greater Toronto Area becoming the fifth largest city in North America. The city-survived recession in the 1990s however was subject to severe homelessness and environmental neglect to the inner city area. Despite this, in 2003 the city embarked on a rejuvenation process improving public spaces to lead the way for citizens to express their own cultural identity and be a part of a wider city culture in an attempt to emphasise creativity and the visual aesthetics of the city. In doing so, Toronto became a place of environmental healing and as a result stirring interethnic gang violence subsided considerably enhancing the poly-ethnic diversity that reigns throughout Toronto today. Getting around Toronto is easy thanks to well-organised streetcars and Toronto Transit Commission subways. Buses run along most city streets however they are rather difficult to navigate. Although expensive the streetcars are a great way to reach the outer suburbs and some of the northern attractions such as the Royal Ontario Museum. Fortunately, the inner city circumference is easy to walk and is very enjoyable as every street has something to explore. Weekend passes for all modes of transport are available for two people sharing the one ticket for 10can$ for the day. Late night fees are $1.85 per trip. All transport runs from 6am – 1.30am. Located in one of the best areas of downtown Toronto, the Canadiana Inn is a short five-minute walk from the CN Tower in the heart of the Entertainment district. 42 Widmer Street provides close access to the eccentric nightlife of John Street without the noise of the surrounding nightclubs and bars affecting your sleep. The hostel offers a free breakfast if you are early enough and provides fresh coffee and tea around the clock. The French style B&B backpackers has six person share rooms available for just 27can$ per night. Staff often provide nightly pub-crawl activities and meet and greets with BYO beverages in the often-chilly courtyard. Formally the tallest freestanding structure in the world, the CN Tower provides exquisite 360-degree views of the ever-expanding Urban spall that is Toronto. It will set you back 25can$ but it is well worth the expense and includes historical facts on the area and the influences and milestones of Canada on a world scale. Surrounding the tower are neatly manicured gardens and it is a short walk to the harbour. 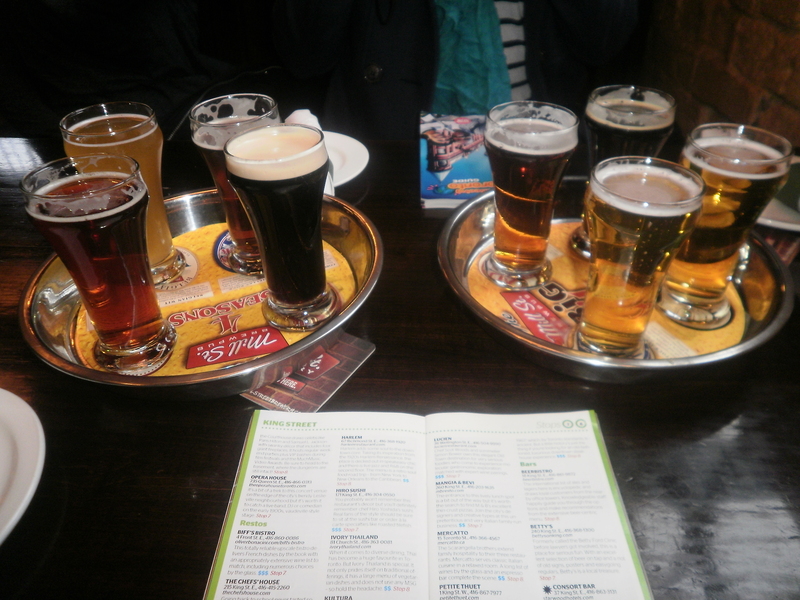 The most historic site in Toronto, the district was home to the Gooderham and Worts Distillery in 1831 and today is a revitalised theatre and gallery district with a phenomenal brewery, the Mill’s Street Brew house. Let the cobblestone streets take you away as you taste exclusive Tank house pale Ale and listen to live acts from Toronto’s underground music scene. 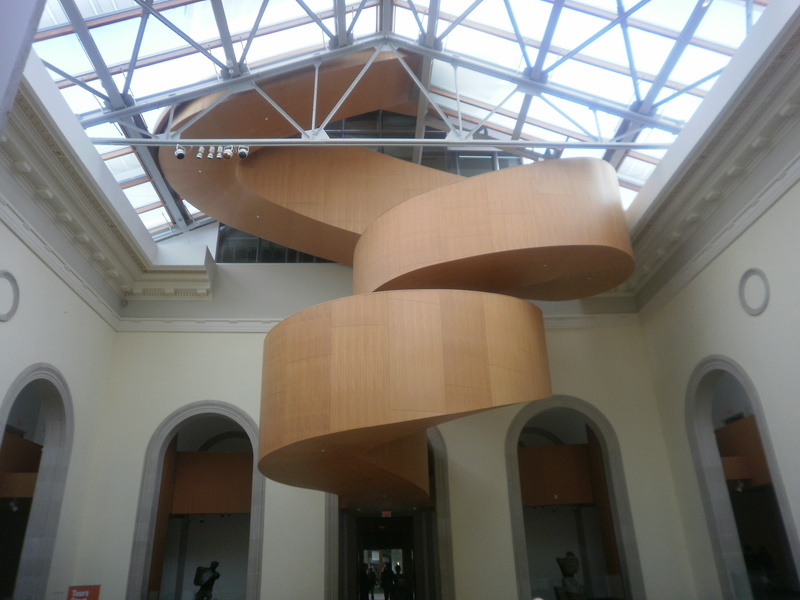 Frank Gehry’s masterpiece staircase inside the Art Gallery of Ontario. The Art Gallery of Ontario designed by Frank Gehry in 2008 is architectural brilliance. Founded in 1900 the ever-expanding gallery is home to some of the world’s finest visual culture with a 79,000 pieces collection. For 10can$ it is hard to miss this modern marvel. One hundred metres down the road is Chinatown where hungry souls can eat great food on a budget of $10. Cuisines ranging from Southeast to Central Asia, Chinatown has an abundance of cheap options. The strip also offers the best electronic deals in town. Look no further than epicurean heaven. The epicentre of the very best cuisine in North American is right here. 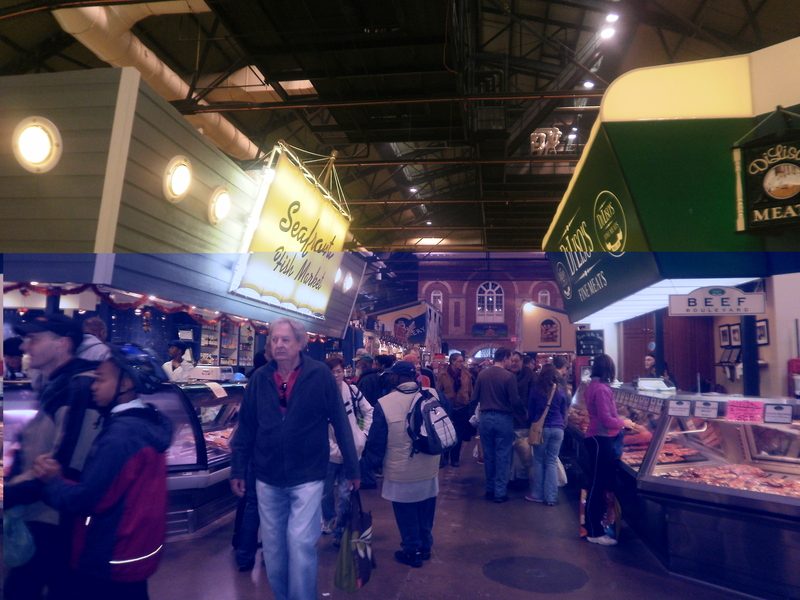 St Lawrence was established in 1903 and has been Mecca for fresh ingredients and a cultural experience ever since. With over 130 vendors, Toronto foodies from around the world come together to share their love for their home-grown secrets with fellow Torontonians. Not many tourists discover Toronto’s best kept secret but it is well worth the attempt. Hidden under downtown Toronto starting at Dundas square lies the intricate 28km underground trail of hidden passageways and shops. Originally created for accessibility between the major financial buildings, P.A.T.H links many of the major subway stations, the shopping centres, major hotels and places of business from their basements allowing for locals to conduct business as usual despite the extreme winter weather conditions.